When we were in Norway, my second cousin Jorunn Sandstøl Birkeland took Maxine, Scott and myself on a tour of where our ancestors came from. She lives in Kleppe which is about ten miles south of Stavanger. We met in Kleppe about 12 noon and drove to Helleland on highway E16 and then turned northeast on highway 42. The first place that we stopped was the Toftene farm (circled on the map). I have a picture of this farm. 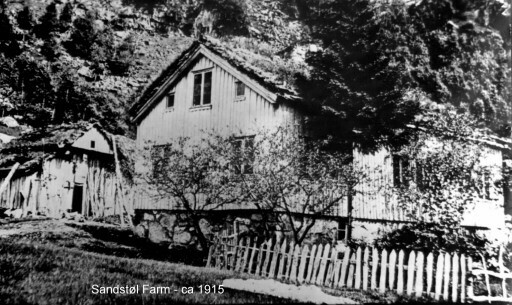 This is where grandma Thompson was born, but only lived here a short time until moving to the Sandstøl farm. 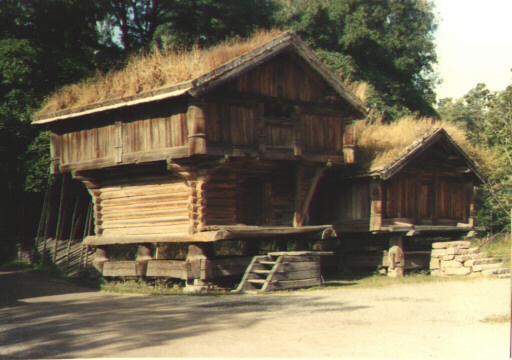 We then drove across the highway to the Øen farm where some of our other relatives lived. We then continued on the highway to the Gya farm where more relatives lived. 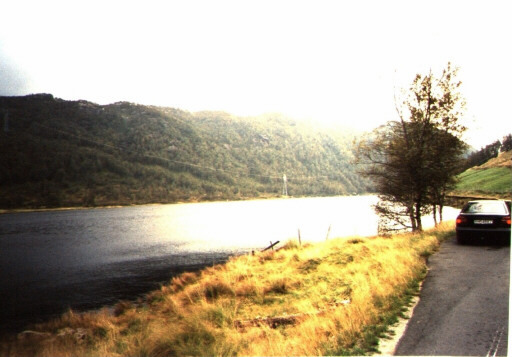 We then proceeded to the Eiklandsdal farm where I had thought that the Kleven farm was located, but I had been wrong. We drove past Mydland where more relatives lived and on to Bjornestad (more relatives). 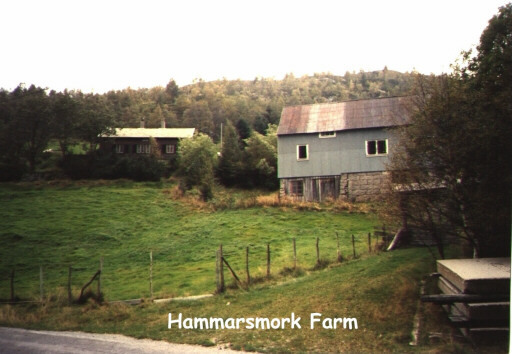 We then turned south to the Hamarsmark farm where I believe Grandpa Thompson was born (pictures below). 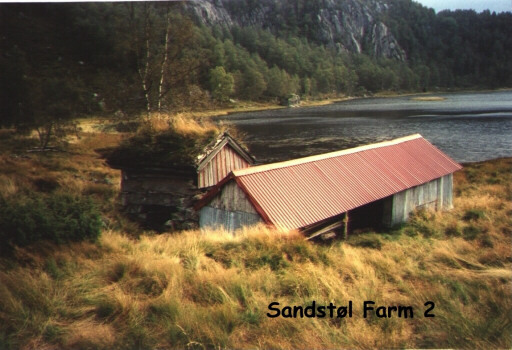 A couple miles further, we parked and walked about one kilometer to the Sandstøl farm which is located on the northeast side of a lake. We had to have rubber boots as we had to cross a stream that was about 40 feet wide but very shallow. The walk ended up along a small canal that still had water running in it. This canal was maybe two feet wide and was completely hidden from view unless virtually stepped in it. At the farm site, the canal turned abruptly towards the lake and the canal was built up so as to the land sloped towards the lake, the canal stayed almost level and ended at a rock dam. Below the little dam was a water wheel the had provided power to a sawmill in the adjoining building. The farm had been abandoned in 1951 due to the road that was built was too far away with no good way to connect to it. There had been several farms in this area and all were abandoned. 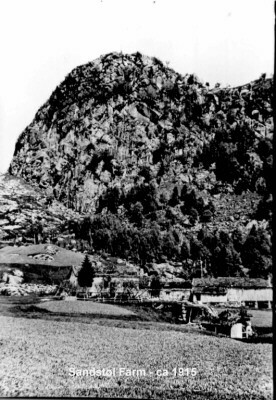 There was still several rock foundations visible and one was currently being used for a hutte (summer home). No sign of any original buildings except for two small 10 x 10 sheds. Jorunn said that these were used to store food for the cattle and sometimes for added sleeping quarters. The local historical society had partially restored and was planning to maintain these buildings as historical landmarks. We then continued on towards Moi and passed Kvitingen, Rusdal, Kjormo, Steinberg, Eik, and then stopped at the Surdal farm (more pictures). Then on to Hove, Handeland, Haukland, and Moi. We then turned west on highway E18 and drove by Skjeggjestad, Heskestad (Rosskleven farm area), and on back to Helleland. At Helleland, Jorunn said that her uncle Martin Sandstøl lived there and wanted to meet us. Martin (90), his wife Othilie (85), son Tore and his wife Ingeborg served us a welcome cake. Martin could not speak English so Jorunn translated but he began to speak some later. He said that his grandfather, Jonas Pederson Sandstøl emmigrated to the USA, died and was buried in the Landa cemetery. He wants a picture of his grandfather's grave. We arrived back in Kleppe at about 6:30 PM. What a wonderful day, wonderful cousin and beautiful country. See the attached map for these locations. 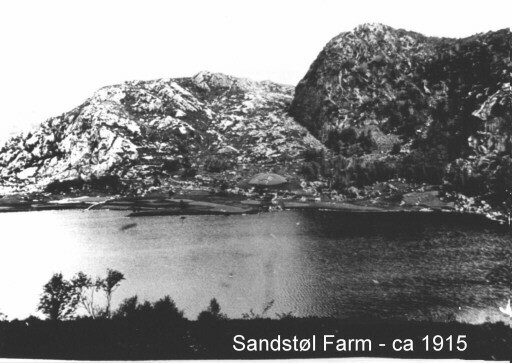 Here are pictures of the Sandstøl Farm. HS refers to Half Screen (~80 KB). Here are some more pictures. 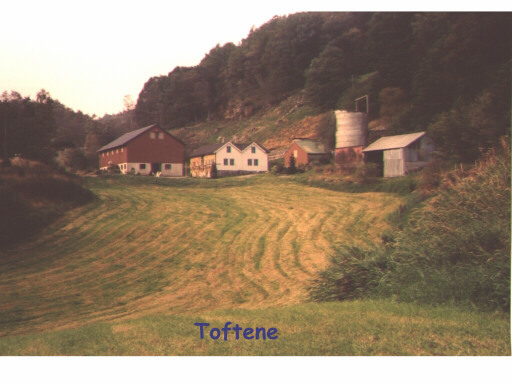 The first is Toftene (northeast of Helleland) where Grandma Thompson was born. She was an Øen and her ancestors came from across the road at the Øen farm. 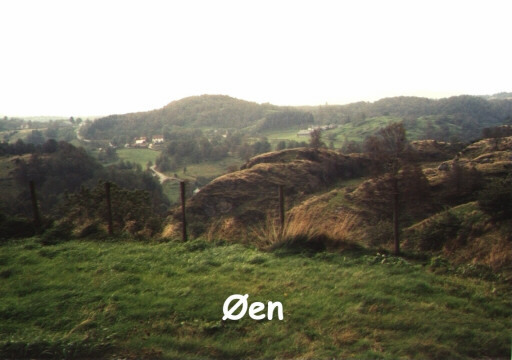 The Øen picture was taken from the driveway of the Øen farm and across the valley. 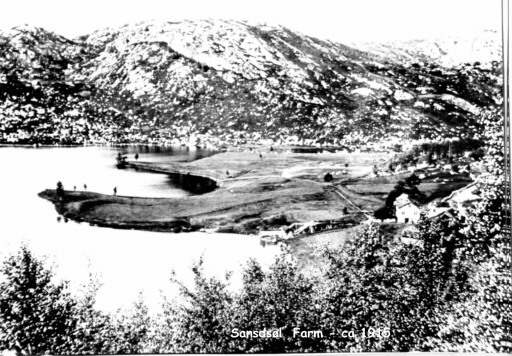 The next picture is the Hammarsmork farm and the next is the lake across the road. These pictures were taken from the same place on the road. Hammarsmork is where we believe Grandpa Thompson was born. A little over 1 mile south of Hammersmork, we parked and started walking along the lake and then crossed a little stream. 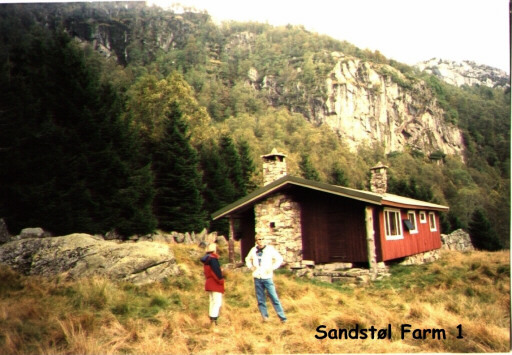 After about a one kilometer walk, we came to the Sandstøl farm site. There was no house or barn but there were foundations of rock. SandstølFarm1N is looking towards the east at a hytte built on an existing foundation. That is Jorunn Sandstøl Birkeland and our son Scott. SandstølFarm2N is standing near where the house was and looking down at the sawmill on the right and the building housing the water wheel on the left. The embankment of the canal is to the far left. 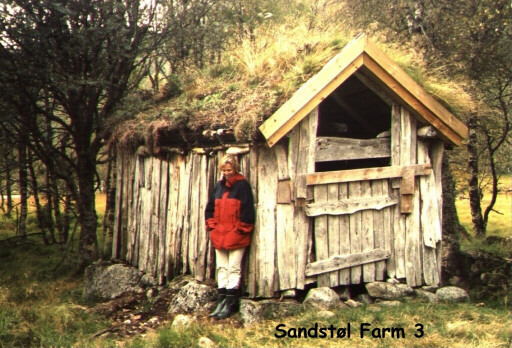 The SandstølFarm3N has Jorunn in front of the partially reconstructed storage shed (one of two on the farm). 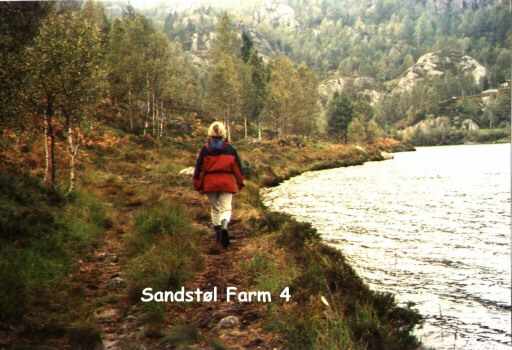 SandstølFarm4N has Jorunn going ahead by the shore of the lake on the way back to the car, the trail was very soggy. 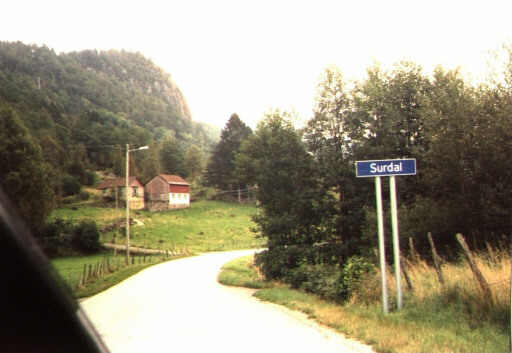 Surdal Sign picture is of a sign on the road south towards the Surdal farm area. The Norwegian farm picture was taken at the Oslo Folk museum and is a typical farm home from the early 1800's that has been moved into the museum. There were probably 20 or more farm homes in this museum, I thought that this would give a little authenticity to the data from Norway. The picture at the Surdal farm does not show anything of the farm.